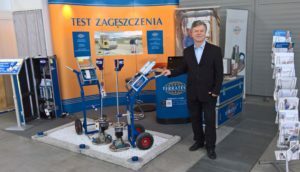 As Autostrada Polska in Kielce represents one of the largest trade fairs for infrastructure and road construction in Eastern Europe, TERRATEST® definitely could not be absent. 500 exhibitors and over 15,000 visitors participated in the event, which was accompanied by numerous seminars and subject-specific discourses. The presentation of the new light weight deflectometers 5000 BLU and 4000 STREAM turned out to be a real success: “The first device -a 4000 STREAM model with several extra features- could already be handed over to a customer right at the end of the demonstration”, proudly declares Mr. S. Furmanczuk, the sales manager of TERRATEST® in Poland. “The new streaming function proves to be a real advantage, when comparing the instrument to competitive products. The possibility of sending measuring results directly from the construction site to the clientele considerably saves time and accelerates the entire business procedure. None of the visitors found it difficult to use the new TERRATEST® App.” The latest versions of the light falling weight for dynamic load plate tests will surely be shown also in the course of the trade fair next year.